A Selection of the Contents: Pore systems and their characteristics (D.H. Everett). Neutron scattering from porous solids (J.D.F. Ramsay). Small-angle scattering studies of porous solids (P.W. Schmidt). Quasi-equilibrium gas adsorption techniques in volumetry, gravimetry or calorimetry (J. Rouquerol et al.). Determination of micropore size distributions (P.J.M. Carrott et al.). Sorption studies on large ZSM-5 crystals: the influence of aluminium content, the type of exchangeable cations and the temperature on nitrogen hysteresis effects (U. MÜller, K.K. Unger). Characterization of microporous catalysts by N2 adsorption: empirical correlations between parameters assessed by different methods (F. Raatz, H. Ajot). Carbon dioxide subtraction method applied to a wide range of porous carbons (C. Salinas-Martinez de Lecea et al.). Characterization of petroleum reservoir rocks by capillary pressure techniques (J.C. Melrose). Measurement of the morphology of high surface area solids (W.C. Conner Jr. et al.). Thermoporometry in the study of porous solids (C. Eyraud et al.). Characterization of catalyst pore structure by parameters describing mass transport (P. Schneider). Non-isothermal sorption kinetics and NMR diffusion studies: fundamental problems of molecular transport in porous materials (R. Haul, H. Stremming). Analysis of pore structure via spin-lattice relaxation measurements (D.M. Smith, D.P. Gallegos). Permeation through zeolite filled silicone rubber membranes (H.J.C. te Hennepe et al.). The fractal nature of molecule-surface chemical activities and physical interactions in porous materials (D. Farin, D. Avnir). Interferometric determination and fractal characterization of gel porosity (M. Sernetz et al.). Routine analysis of the pore structure of mesoporous and macroporous solids by gas adsorption, mercury porosimetry and densitometry (M. Day, R. Fletcher). Pore structure analysis of American coals (D.P. Gallegos et al.). Characterization of the effective pore width of molecular sieve solids by means of catalytic test reactions (S. Ernst et al.). Investigations on the micro-structure of hardened cement pastes (H.H. Willems et al.). The preparation and characterization of porous silica spheres of a controlled texture (C.J.G. van der Grift et al.). Adsorption of albumin to porous silicas (E. Amano et al.). The importance of porosity has long been recognized by scientists and engineers. 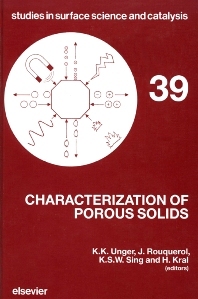 Porous solids are widely encountered in industry and everyday life and their behaviour, e.g. chemical reactivity, adsorptive capacity, and catalytic activity is dependent on their pore structure. A considerable amount of work on porous solids has been undertaken both in academic and in industrial laboratories. However, all this activity is in urgent need of a critical appraisal. To undertake this task, a number of leading experts in the field of adsorption, porosimetry, X-ray and neutron scattering, optical and electron microscopy, calorimetry and fluid permeation, were brought together at the 1987 IUPAC (COPS I) Symposium. This proceedings volume provides an up-to-date overall review of the theoretical foundations for modelling and characterizing porous systems. It deals with most of the techniques in current use as applied to both model systems and porous solids of industrial importance. The reader will find the description and discussion of a number of novel techniques as well as a critical appraisal and comparison of the more established methods. All those concerned with the characterization of porous solids in academic and industrial laboratories will find much to interest them in this volume. It should be on the bookshelf of applied research centres involved in adsorption, catalysis, purification of gases and liquids, pigments, fillers, building materials, etc.